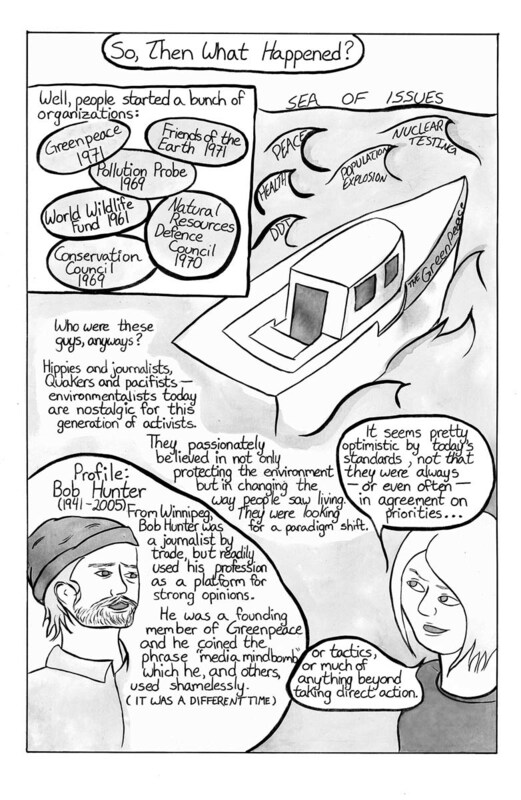 The original idea of my project A Brief, Accurate, Graphic History of Environmental Activism was a series of case studies looking at environmental campaigns that succeeded and those that failed in order to draw lessons for people wanting to act on environmental issues. The research involved would have been prohibitive so I gave it up, but I still wanted to cover some big ideas in a small number of pages. 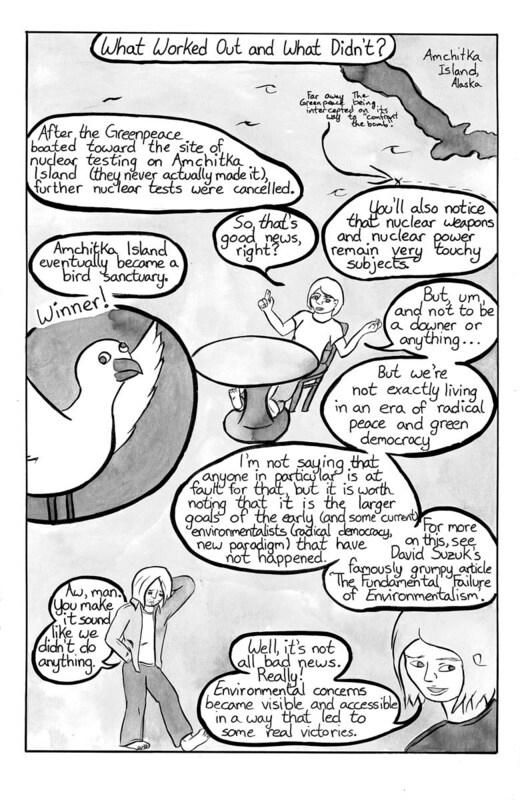 My hope was that I would end up with a sort of skeleton of the history of environmental activism that people could build on. 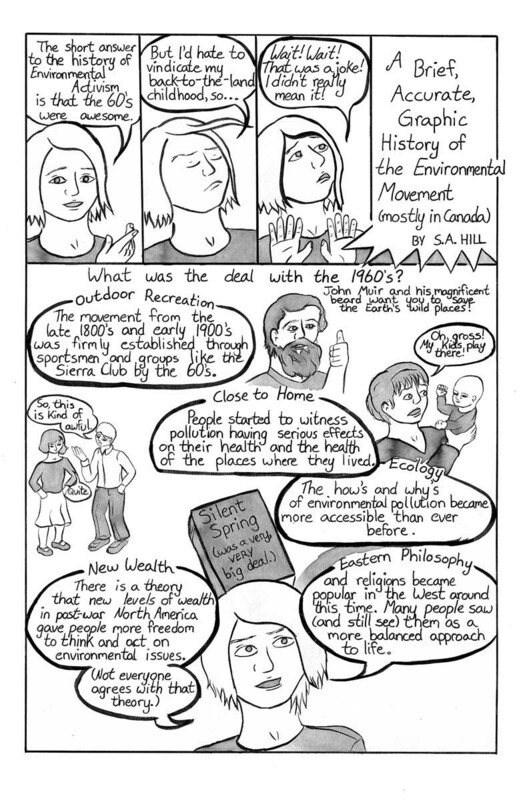 Essentially, it’s a primer on environmental topics and activism in Canada. I hang out with a number of environmentalists and really sympathize with that activist streak. At the same time, I come from a social science background, so I wanted to talk about activism in historical, rather than moral, terms. I did a really rough early draft and realized I needed to do a lot more research, so I started doing my reading, listening to podcasts (thanks, Nature’s Past! ), and drew on my background in environmental studies and my subscription to the New Yorker. 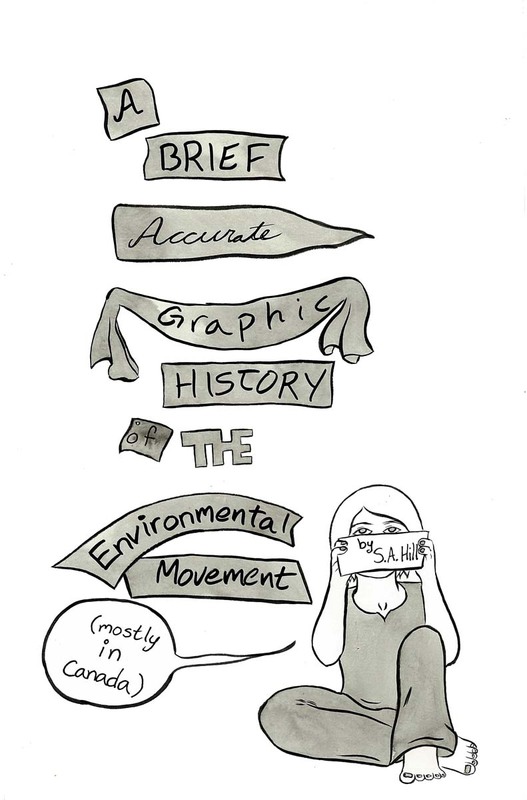 I ended up dividing environmental activism into a few time periods. One was the late 19th– early 20th-centuries, which I didn’t actually cover in the book because it’s complex enough to deserve more pages than it was going to get in this project. The other three were the late 1960s and the 1970s, the 1980s, and the 1990s into the aughts. I think there was a definite shift in goals and process on the environmental front in each of those periods, starting with the real utopian, ad-hoc vibe of the early movements, moving into the more professionalized system of the 80’s, and ending up in the 90’s and early aughts, when technology and the global nature of both problems and responsibility have really switched up the activist handbook. The kind of issues people were working on changed as well, from basic pollution standards and nuclear weapons, to logging and acid rain, to the more diffuse (responsibility-wise) problem of global warming. I also tried to squeeze in primers on some of the big questions about how environmentalism and environmentalists have fit in with things like corporations and government and Canada, geographically speaking. I started this project a few months after I finished a program in comics and graphic novels, and I put my nascent drawing skills to work churning out pencils as fast as I could. 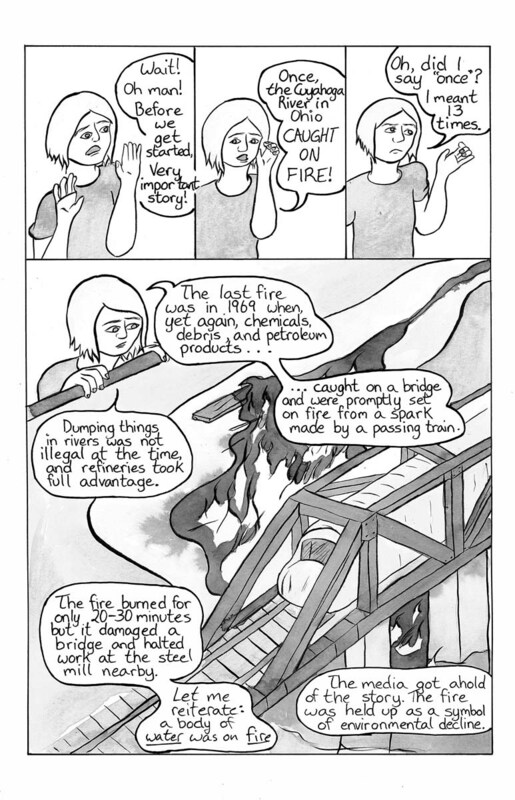 I added a couple pages partway through, since I had neglected to write a conclusion, and because I thought it was really important to make jokes about rivers catching on fire. After the pencils were finished I inked them with a brush, scanned them, shaded them with inkwash, and spent a very long time correcting (some) mistakes using the computer. Page 1, actually drawn about two months after the others. Page 2, this was the first page drawn for this project. Page 3, I always think environmental groups started in the sixties, but it was really the seventies before things got going. Fun! But where are all the scientists, politicians, and bureaucrats? Environmentalism was far far more than peaceniks, Rachel Carson, and people power. You are absolutely correct! One day, I will do a properly comprehensive history, but I was squeezed for time and space. Great point, Hank. I neglected to include much discussion of the role of scientists and bureaucrats in our episode on the environmental movement in Canada for Nature’s Past. I sense a need for another episode in the future.